The growing number of disgruntled rural residents who feel betrayed by municipal amalgamations that were forced upon them, have found a champion in Carleton-Mississippi Mills MPP Jack MacLaren. MacLaren has gotten behind a proposal put forth by a group from the former Goderich Township, in which it wants to use an obscure and long forgotten constitutional remedy to de-amalgamate their ward from the Municipality of Central Huron. MacLaren says he will present a petition at Queen’s Park in support of the group’s position. Landowners attend the historic presentation of a Petition of Right to Attorney General, the Hon. Madeleine Meilleur by MPP Jack MacLaren. On the heels of a highly successful International Property Rights Conference held Oct. 4, in Ottawa in which an International Property Rights Association was formed, MacLaren, along with Len Harris, a former Australian senator and an outspoken advocate of property rights, have been stumping the province speaking to landowner groups in an effort to not only raise awareness of the newly-formed group but also the need for property owners to assert their rights. Speaking at the farm of Jerry and Joan Huzevka near Petrolia recently, MacLaren noted that in 2001, without the consent of its residents, the former Goderich Township, Town of Clinton and Township of Hullet were amalgamated to become the Municipality of Central Huron. He added that Goderich Township is on the shores of Lake Huron and is consequently higher valued real estate and currently pays 61 per cent of the property tax for the entire amalgamated municipality and the majority of those tax dollars go to capital expenditures in the former Town of Clinton. “These people are unhappy about paying the lion’s share of the taxes and getting very little in return,” he said, adding the township next door to them along the lake pays half the property taxes they pay. MacLaren noted that Brian Barnim, a Central Huron councillor and Cindy Moyer, the former president of the Huron-Perth Landowners Association did an extensive amount of research and discovered the Petition of Right from 1628, an ancient Constitutional Law they determined still stands today. He said the way it worked 400 years ago was that if a group of people felt they had been wronged, they could take up a petition and if they could get two-thirds of the community to sign it, they could serve that petition on the King or Parliament to let right be done because a two-third majority represented the will of the people. MacLaren noted that Brian Barnim took up a petition to de-amalgamate and it was signed by more than 70 per cent of the property owners in the former Goderich Township. “Now it’s a matter of going to the legislature with it,” said MacLaren, adding that he expects to present it sometime in November 2014. He added that he had a 45 minute meeting with the clerk of the legislature and found that the Legislature has no procedure in place to deal with it. Consequently, he said he will present it as a regular petition, of which many are presented each week in the Ontario Legislature. “This will get it recorded in Hansard and then I will present it to the province’s Attorney General, the Hon. Madeleine Meilleur, and she is obliged to forward it to Ontario’s Lieutenant Governor who is obliged to say let right be done, as the King did 400 years ago,” said MacLaren. MacLaren noted that the Petition of Right was used successfully in 1986 in a litigation involving Air Canada and the B.C. government. MacLaren, a former OLA president, who runs a 530-acre cash crop and beef operation on the banks of the Ottawa River, said he never had a great ambition to be a politician but got involved because of his concerns over the loss of property rights and the inaction by farm organizations. “I noticed a lot of the problems in the rural communities began when government came knocking on our doors or were passing legislation telling us what we could or could not do as farmers, whether it was endangered species legislation, wetlands or whatever,” he said. MacLaren said when land use is taken away it lowers the value of that property and the owner’s wealth is essentially being confiscated by government. “Basically, it’s expropriation without compensation,” he said. The Progressive Conservative MPP said that it’s often a lonely struggle at Queen’s Park for anyone fighting for private property rights. “They don’t respect property rights and there are only a few of us at Queen’s Park that are willing to take up that battle,” he said, adding that is buoyed by the support he gets from property owners he meets while touring the province. This article was first printed in the Ontario Farmer. 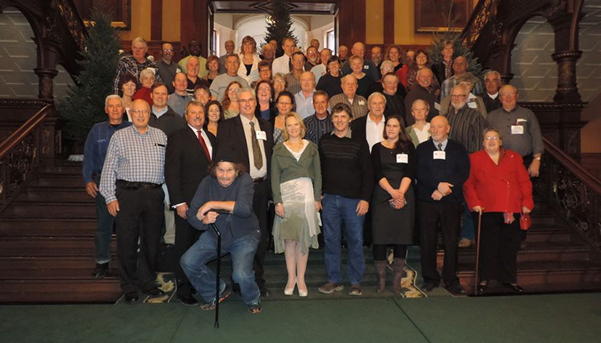 As planned, on the morning of November 27th, Jack MacLaren MPP for Carleton-Mississippi Mills, presented the Petition of Right for de-amalgamation of Goderich Township from the municipality of Central Huron. The Petition of this type requires signatures from 66% of eligible voters. The Petition presented by Mr. MacLaren was accompanied the signatures of 75% of the voters of the former Goderich Township. The Petition was accepted by the Attorney General, the Hon. Madeleine Meilleur. After a brief conversation, Mr. MacLaren and the AG shook hands and agreed to meet on the subject at a later date. Many Landowners from across Ontario came to observe this historic event, some travelling more than five hours by bus. We are very proud of MPP Jack MacLaren, Cindy Moyer, and Brian Barnim for their dedication to this historic event.